Jaguar Land Rover India today announced the price of Jaguar’s first performance SUV, the all-new F-PACE starting from ₹ 68.40 Lakh (ex-Delhi). Customers can now book it online or through any of the 23 authorised Jaguar Retailers located near them. The launch of F-PACE in India on 20th October 2016 marks a significant milestone in the expansion of Jaguar’s product offering in India. F-PACE is Jaguar’s first performance SUV and is sure to capture hearts and minds of Jaguar fans and its distinguished & discerning customers spread across India. Visually inspired by F-TYPE, the all-new Jaguar F-PACE is a performance SUV that has the DNA of a sports car. Its powerful and agile look makes it utterly distinctive and gives it a head-turning road presence. From the bonnet bulge to the pronounced rear haunches, the all-new F-PACE reinvents the energy, strength and purity of form of F-TYPE. Even at night, the all-new Jaguar F-PACE is instantly recognizable, thanks to its Adaptive LED Headlights featuring Jaguar’s signature ‘J’ Blade Daytime Running Lights. Adding to F-PACE’s commanding on-road presence, Adaptive LED Headlights produce an intensity of light that is close to daylight, which helps to distinguish objects more easily and reduces fatigue. At the rear, full LED tail lights echo F-TYPE’s distinctive design language. The all-new Jaguar F-PACE’s interior blends sportiness and elegance to create the latest in contemporary design. Jaguar’s extensive range of premium materials, handpicked leathers and sophisticated finishes, give F-PACE one of the most comprehensive interior choices in its class. This is the perfect opportunity to create a space that reflects individual style. Configurable Interior Mood Lighting highlights the finest interior design details with soft pools of light in a choice of ten different colors. F-PACE’s modern interior design means essential controls are intuitive to use and always close at hand. A high centre console and the Sports Command Driving Position help the driver feel connected and secure, while the slender roof pillars and a large windscreen mean that the all-round visibility is excellent. The all-new F-PACE’s rear knee and leg room are amongst the best in class and it has a 40:20:40 seating configuration for greater flexibility. The seats can be folded completely or folded individually in a variety of combinations. Powered and Gesture Tailgate are available as options on the 2.0 l diesel derivatives and standard on the 3.0 l diesel derivatives. With Gesture Tailgate one does not even have to touch the car; they simply have to present their foot under one of F-PACE’s rear flanks and the tailgate opens or closes. 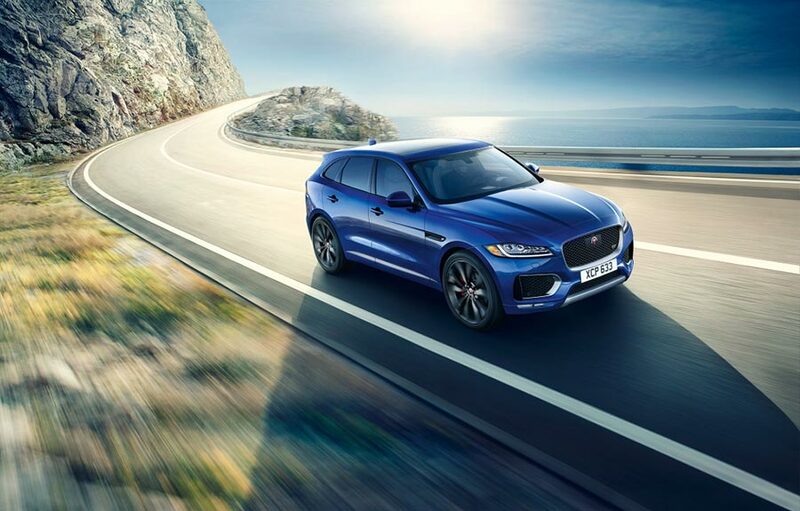 The all-new Jaguar F-PACE is offered with the 2.0 l (litre) 4-cylinder 132 kW Turbocharged Ingenium diesel engine. Ingenium is Jaguar Land Rover’s new breed of engines designed for effortless performance, refinement and efficiency. With advanced technology and all-aluminium construction, Ingenium delivers impressive fuel consumption and CO2 emissions. Up to 20 kg lighter than equivalent previous generation engines, Ingenium is intrinsically more efficient. The powerful 3.0 l (litre) V6 Turbocharged Diesel engine offers exceptional refinement and efficiency, increasing power to 221 kW and torque to an impressive 700 Nm for improved performance and excellent drivability. The engine uses innovative twin parallel sequential turbocharging – a concept pioneered by Jaguar Land Rover – for smooth, more immediate delivery of power at all engine speeds, as well as two-stage water cooling to conserve energy. This engine delivers an acceleration of 0-100 km/h in just 6.2 s.
Jaguar has been at the forefront of aluminium car construction for more than a decade. Its latest innovation is the Lightweight Aluminium Architecture that provides the foundations for the all-new F-PACE. Jaguar uses aluminium where possible because it creates a stiff, strong and most importantly, lighter architecture. The architecture’s incredible strength offers excellent protection to all occupants, while its reduced weight enhances handling and braking. Aluminium has also been used to form the body sides, bonnet and front wings of F-PACE. The use of aluminium enables F-PACE to be amongst the lightest cars in its class – boosting efficiency from the outset. The reduced weight of F-PACE’s structure is distributed with a near perfect 50:50 balance for a sporting performance and an impeccable ride. The Activity Key, F-PACE’s unique new feature, makes living life to the full even easier and one can wear it like a wristband. It is robust and fully waterproof and allows one to enjoy a range of outdoor activities – from skydiving to swimming. One can use the Activity Key to lock and unlock their car. When exiting the car, the conventional key fob can be left in the car and the Activity Key can be presented to the tailgate to lock it. The conventional key fob is then automatically deactivated for security. The all-new Jaguar F-PACE’s Torque Vectoring by Braking maximises capability through even the tightest corners. Torque Vectoring technology provides controlled independent braking on the individual inside front and rear wheels to add to the turning forces acting on the car. In most conditions, more braking pressure is applied to the rear inside wheel as this supports the most increased cornering capability, while the front inside wheel is braked for greater effectiveness and refinement. The result is reduced understeer for sharper turning and more consistent road holding. Torque Vectoring delivers increased sports car-like agility and added driver confidence. The First Edition draws inspiration from the CX-17 Concept and offers an experience and excitement of driving the F-PACE with the individuality of limited edition style. The Jaguar F-PACE First Edition is available with 3.0 l (litre) V6 221 kW Turbocharged diesel engine. The First Edition customers can choose one of two unique paint colours, which reflect the C-X17’s original two colourways: stunning Caesium Blue or regal Halycon Gold. The First Edition is also available in Rhodium Silver or Ultimate Black. Further design details include 50.80 cm (20) Venom Alloy Wheels with Gloss Black finish, a unique interior with Houndstooth embossed Windsor Leather Sports seats, special carpet mats and a Gloss Black trim finisher, which also features the modern yet quintessentially British Houndstooth pattern. Whether one is accelerating on the motorway, cornering on country roads or navigating around town, Adaptive Dynamics modifies F-PACE’s response to match the conditions and their driving style. It analyses acceleration, cornering, throttle and brake pedal activity as well as kick-down activation. Steering and body movement are analysed up to 500 times a second. Electronically controlled dampers then constantly adjust to optimise the suspension settings and maintain F-PACE’s dynamism and comfort. Red brake calipers, Full-LED Headlights with LED ‘J’ Blade Daytime Running Lights, Sliding Panoramic Roof, Illuminated Metal Tread plates and Configurable Interior Mood Lighting are amongst the other luxurious features also included as standard on the First Edition. The sporty look is completed by the S model body kit, which comes as standard.